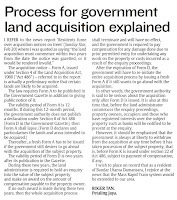 The acquisition notice – Form A, issued under Section 4 of the Land Acquisition Act, 1960 (“Act 486”) – referred to in the report is actually a preliminary notice that certain lands are likely to be acquired. The law requires Form A to be published in the Government Gazette in addition to giving public notice of it. Thereafter, a fresh Form A has to be issued if the government still desires to go ahead with the acquisition of the subject property. The validity period of Form D is two years after its publication in the Gazette. During these two years, the land administrator is required to hold an enquiry into the value of the subject property and make an award on the amount of compensation payable to the property owner. If no such award is made during these two years, then the whole acquisition process shall terminate and will have no effect, and the government is required to pay compensation for any damage done due to prior permitted entry for undertaking any work on the property or costs incurred as a result of the enquiry proceedings. After the expiration of Form D, the government will have to re-initiate the entire acquisition process by issuing a fresh Form A if it still wants to go ahead with the acquisition. 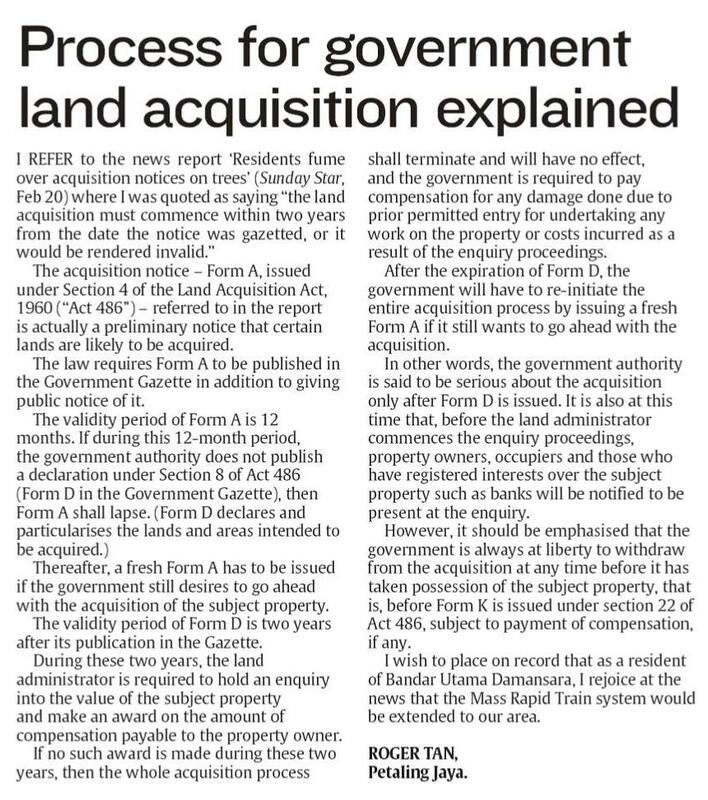 In other words, the government authority is said to be serious about the acquisition only after Form D is issued. It is also at this time that, before the land administrator commences the enquiry proceedings, property owners, occupiers and those who have registered interests over the subject property such as banks will be notified to be present at the enquiry. However, it should be emphasised that the government is always at liberty to withdraw from the acquisition at any time before it has taken possession of the subject property, that is, before Form K is issued under section 22 of Act 486, subject to payment of compensation, if any. I wish to place on record that as a resident of Bandar Utama Damansara, I rejoice at the news that the Mass Rapid Train system would be extended to our area. Thanks for giving the public a lesson about the procedure.